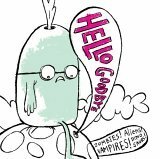 Music Review: Hellogoodbye – Zombies! Aliens! Vampires! Dinosaurs! My latest music love has been the band, Hellogoodbye. Brings back some serious memories considering that Forrest Klein, the vocals and the man behind the music itself… started out composing midi tracks late at night because he didn’t want to wake his parents. Never seeking out fame, the music went unnoticed until a mutual friend brought it to their current label, and the label was floored. Truthfully? You think it’s all an image thing, but he really seems to like to look like he came from Buddy Holly’s era a bit. And every single music video seems to run the whole nerd/geek thing loving cheerleader type. But you have to admit that a lot of people really connect to that image. And then there’s this amazing electronic music and the use of autotune. Very upbeat music and totally worth looking into if you like indie electronic/powerpop. Their latest album, Zombies! Aliens! Vampires! Dinosaurs! , is everywhere to be found including . And in case you’re just not knowing what the big deal is about? Check out their mv of Baby, It’s Fact.